Tony Sagami writes: Beijing's latest stimulus package was a great sign that the country is devoted to future economic growth. And I think all the measures — which include infrastructure spending and tax deductions for exporters — are great news for investors focused on Asia. But today I want to spend some time looking at another set of important economic indicators — the American pastimes of baseball and basketball. Baseball, even though it's a wonderful game that many of us grew up playing, is a business at the professional level. Selig also warned owners not to get “too cocky with respect to ticket prices” because attendance fell for the first time since 2003. Overall attendance for the 30 baseball teams was 78.6 million this past season, down 0.7% from 2007. As you can see, even the baseball business is feeling the pain of a slowing U.S. economy! Lines at a New York City jobs fair swell as unemployment hits a 14-year high. The October employment report showed that our economy lost 240,000 jobs last month, bringing the year's total job losses to 1.2 million. Ford and General Motors reported horrendous third-quarter results and are begging the government for billions of free money to keep them afloat. Consumers are slamming their wallets shut. Same-store sales at American retailers dropped by 0.9% in October, the steepest drop in nearly 40 years. Not all businesses are feeling the same pain as the automakers and professional baseball. In fact, some businesses are still thriving — including professional basketball. Last week, the National Basketball Association (NBA) announced a multibillion-dollar joint venture with AEG to operate 12 basketball arenas in China. The NBA isn't a newcomer to China, either. The NBA first began doing business in China 30 years ago. And it now has more than 100 employees in four Chinese cities, as well as 15 marketing partners in China. 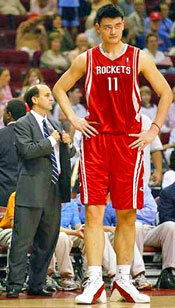 Yao Ming has made China a basketball-crazed nation. Thanks to Yao Ming, China has become a basketball-crazed nation. I know because I saw it with my own eyes during the Beijing Olympics when the U.S. played Greece. I was surprised to see more than 90% of the seats filled with enthusiastic, knowledgeable, cheering, and rabid Chinese basketball fans. AEG owns or controls facilities such as the STAPLES Center in Los Angeles, the Prudential Center in Newark, and the Color Line Arena in Hamburg, Germany. AEG also owns several sports franchises including the Los Angeles Kings (NHL), the Hammarby (Sweden) Futbol Club, and part of the Los Angeles Lakers. The NBA and AEG will build and operate arenas in at least 12 Chinese cities, including Shanghai and Beijing, to host either a Pan-Asian basketball league or an NBA-operated Chinese league. The reason for the deal is simple: MONEY! The slowing U.S. economy makes it more important than ever to include China in a company's marketing plans. And the NBA and AEG are doing exactly that. What's more, I believe that the only companies that will grow their profits over the next few years will be ones doing a significant amount of business in China and/or Asia. 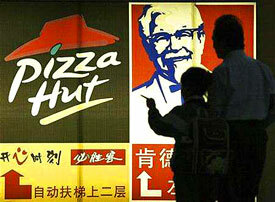 Yum Brands operates 2,500 stores in China and expects to open 1,400 more in 2009. Example: Yum Brands — The operator of KFC, Pizza Hut, and Taco Bell has 2,500 stores in China and expects to open 1,400 more stores by the end of 2009. Yum Brands now gets more than 50% of its revenues from outside North America and has made China one of its most important growth markets. Like the NBA and AEG, Yum Brands realizes the huge profit potential in China. More importantly, YOU need to make sure that your portfolio is filled with stocks that are positioned to prosper in China. Conversely, you want to AVOID companies that are going head-to-head against Chinese companies. Example: Dell Computer — Business is so bad at Dell that it's asking all employees to take unpaid leave, freezing new hiring, and offering severance packages to cut its workforce. The reason is simple: Taiwan-based Acer and China-based Lenova are eating Dell's lunch. Remember this simple rule for making money in the next decade: Get “long” on companies that are selling to China and get the heck out of any companies that are competing against China. Ignore that rule and your portfolio will get hammered. Following it will lead to prosperity.